"In the legends of the traditional people of the northwest coast, the sighting of lightning was thought to be a Thunderbird hunting for prey. The Thunderbird hunted large animals such as whales and he did so with the help of the Lightning Snake. The Lightning Snake lived under the wings of the Thunderbird and struck the animal before the Thunderbird would pick it up with its enormous talons. 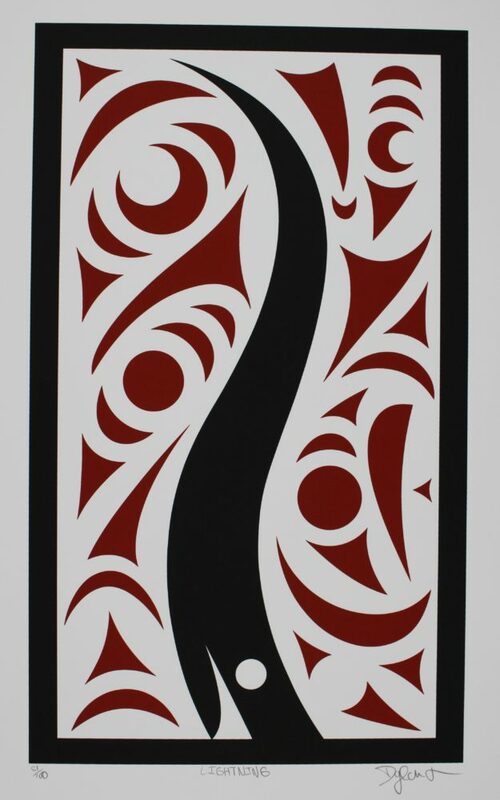 Most often the Lightning Snake if only represented in images with the Thunderbird but this print depicts the Lightning Snake alone, striking from the sky." This limited edition silkscreen print titled "Lightning" by Dylan Thomas was hand produced by the screen printing process. It is the only limited edition printing of this design. The artist has inspected and signed each copy in the edition. All trial copies of this edition have been destroyed and the printing stencils obliterated.